What could be more heartening and filling than a delicious bowl of Irish stew, Ireland's National Dish and loved the word over. Though a hugely popular dish on St Patrick's Day, this dish is far too good to keep for a few days a year; eat it when you want a comforting and warming dish. 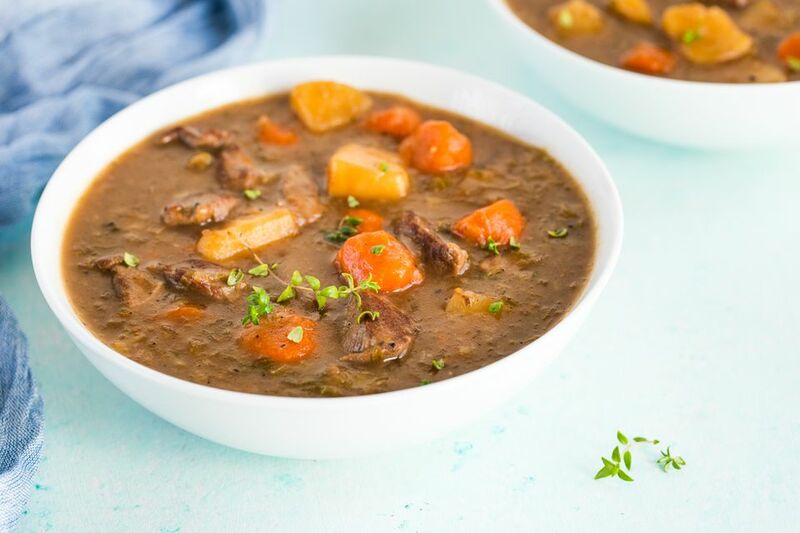 Irish stew was traditionally made with mutton - older sheep - but more often nowadays, is made with lamb which may seem a little of a waste but the flavor is amazing. Controversy reigns over whether adding vegetables other than potatoes is a perfect Irish stew. Though adding onions, leeks and carrots do add extra flavor and nutrition to the stew. Ultimately, the choice is yours. Whatever you decide it will be lovely. The beauty of the stew when it contains vegetables is little else is needed alongside save perhaps a bowl of Colcannon. Heat the oven to 350 F/ 180 C/ Gas 4. In a large frying pan heat half the oil to hot, but not smoking. Add half the lamb pieces and brown all over by turning in the hot oil. Remove the lamb with tongs and place in a casserole. Cover with a half of the quartered potatoes, onions, leeks, and carrots. Add the remaining oil to the frying pan, heat again then add the remaining lamb and brown all over as before and add to the casserole. Cover with the remaining vegetables. Add the flour to the frying pan and stir really well to soak up any fat and juices. Cook on a gentle heat for 3 minutes. Then add stock a ladle at a time until you have a thick, lump-free sauce. Pour this sauce over the lamb and vegetables. Add the remaining stock to the casserole, cover with a tightfitting lid, cook in the oven for 1 hour. Add the cabbage (if using), replace the lid, and cook for another hour. Check from time to time to make sure the stock isn't reducing too much, if it is add a little boiling water. The meat and vegetables should always be covered by liquid. If the sauce is too runny at the end, you can always cook a little longer with the lid removed. Season with salt and pepper. Serve piping hot and as it already has plenty of potatoes and vegetables it is unlikely it will need more. Perhaps a little crusty bread would be good though to soak up all that fabulous gravy. Like all stews and casseroles, they benefit from being made the day before, this is no exception.